Fifteen U.S. boys, ages 13-16, all wearing Sikh turbans, are spending 10 days at California’s Bhujangi Academy, a ten-day outdoor camp for at-risk teens. The 15 were chosen carefully from Sikh families living in the U.S. that are worried their young teens are having problems with school or family, exhibiting low self-esteem or motivation, making poor peer or relationship choices, defying authority or responsibility, or experimenting with drugs or alcohol, say camp officials. The camp is designed to instill Sikh traditions and provide life skills, goals, and expectations. A major goal is connecting Sikh boys — most whose families come from the Punjab area between India and Pakistan — to their roots and heritage, according to organizers. “This is a population no one connects with,” said Deep Singh, one of the camp creators and a founder of Jakara Movement, a group that organizes projects and activities for the Sikh youth of California. 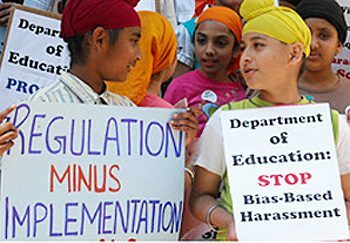 Most “Khalsa schools” that teach Sikh youth in America about their heritage and faith cater to children under 12, he said. Between 18 and 25, young Sikhs who have grown to be responsible adults become involved with Sikh student associations in universities, he said. But it is in those early teenage years that “there is a critical gap that our community overlooks,” said Singh, a former high school teacher. Sikh parents often get frustrated with the cultural barrier and generation gap between them and their children — who are being raised in U.S. culture, he said. The parents worry that they don’t have an effective means to convey Sikh culture and religion to the next generation. So, this week in the Sequoia Mountains of Kings Canyon National Park, about one hour from Fresno, 15 young teenage boys are being immersed in Sikh heritage. The area is self-enclosed and has all the necessary facilities, said Singh. “Boys respond well to physical settings,” said staff member Amandeep Kaur Dhillon. “The program is structured with things they like, such as hiking. You have to have something that rings them in, so they do not realize that they are in session eight hours a day. “If effective, we hope to keep continuous contact with these young people and create life-long relationships,” Singh said. Substance abuse also creates anger problems, Dhillon added. And if they fall into that pattern, they can spiral down and hit bottom. Sikhism considers itself the fifth-largest organized religion in the world — after Christianity, Islam, Hinduism and Buddhism. Sikhism teaches there is one God — Vāhigurū — who is shapeless, timeless and sightless. Sikhism advocates the pursuit of salvation through disciplined, personal meditation on the name and message of Vāhigurū. Sikhs study the teachings of ten Sikh gurus, or enlightened leaders, as well as the Sikh holy scripture, the Gurū Granth Sāhib Ji. The essence of Sikh teaching is said to be summed up by the founding Guru Nanak as: “Realization of truth is higher than all else. Higher still is truthful living.” Sikh principles do not attach any importance to vows of poverty, instead encouraging the accumulation of wealth. Sikh men are traditionally prohibited from cutting their hair or removing their turban in public and often carry traditional Sikh daggers passed down over the generations.